This book isn’t so much about fashion history as it is about social history. I loved it. 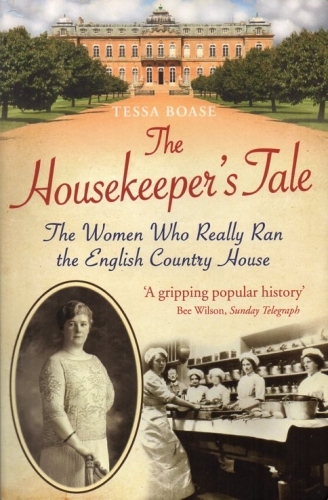 Cover of The Housekeeper’s Tale by Tessa Boase. Please do not copy. “This was the top job for a working woman in the nineteenth century. You could do not better, nor live more comfortably or with greater security…. Uniquely, it was a life that had no need of a man…. She ended the century in a black silk dress, a senior management figure of absolute authority…. She answered only to the mistress of the house, hiring and firing dozens of maids and controlling the entire household budget.” — Boase, pp xii-xiii. The Housekeepers’ Tale is well-footnoted from some famous and some obscure sources, with a bibliography that promises more engrossing reading for the armchair time-traveler, but Boase wears her scholarship lightly. It reads like a series of novelettes. If you love the downstairs part of “Upstairs, Downstairs” or “Downton Abbey,” there are great stories here. After Victorian Working Women and Munby, Man of Two Worlds reawakened my interest in the lives of 19th century servants, Boase’s Housekeeper’s Tales provides additional evidence that real lives are much more riveting than those on TV. The subtitle of The Housekeeper’s Tale is The Women Who Really Ran the English Country House — and some of their stories are quite dramatic. 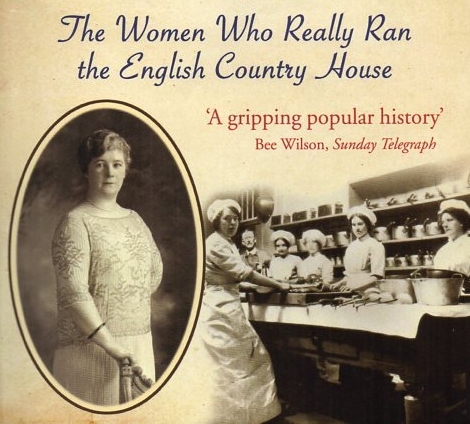 Boase first tells the story of Dorothy Doar, Housekeeper at Trentham Hall from 1818 to 1832. Unusually, Mrs. Doar was already married, and the mother of a child, when she was hired. She lived at the Great House; her husband moved to a nearby village, and she used her salary to support him and put her daughter through school. 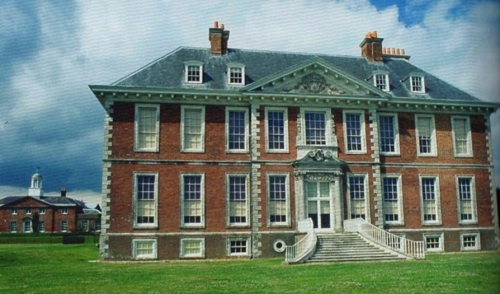 Her employers, the Duke and Duchess of Sutherland, moved among their five houses (one was a castle) during the year, and were among the wealthiest landowners in Britain. 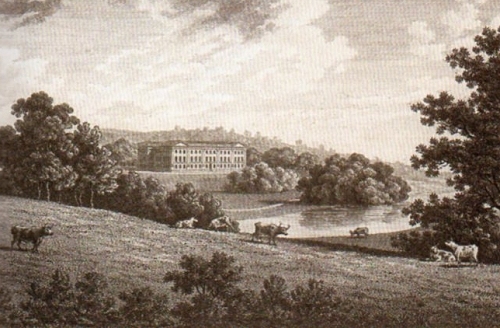 They spent just a few months per year at Trentham Hall. Tessa Boase uncovered the story of Mrs. Doar (“like a gnat squashed between the pages of a book”) in packets of correspondence between two land agents working for the Marchioness of Stafford (as she was then titled.) One of them wrote that he considered “Mrs. Doar’s wages too small for the faithful discharge of such a trust,” but she didn’t get a raise. In fact, she was fired, after 14 years of service, for becoming pregnant by her husband. “It is quite impossible in such an establishment to permit of her breeding,” an agent said. What happened when Mrs. Doar asked for six weeks’ maternity leave makes for painful, page-turning reading. “What shall we do for a living? Please God find me work to do. 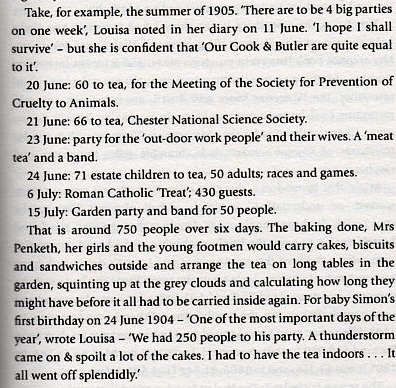 How cruel of that woman.” — Sarah Wells’ Diary, early in 1893. Meals served — in addition to the usual four a day — during roughly three weeks in 1905. Louisa was Mrs. Yorke, Ellen’s employer. Text from The Housekeeper’s Tale, by Tessa Boase. Sixty people for tea one day, sixty-six people the next! Followed by a party two days later, and 121 people to tea the day after that! At the end of each of these days (after stupendous amounts of baking,) Ellen would take off her cook’s apron, drag herself into the Housekeeper’s room, and do the accounts. Her job involved paying the servants and the tradesmen’s accounts in cash. Sometimes the equivalent of ten thousand pounds cash in today’s money would pass through her hands, while she earned the equivalent of 2,500 pounds per year. The Yorkes insisted that Ellen spend less on household expenses, but the number of house parties and other entertainments they gave increased every year. If their expenses were “too high,” Ellen was scolded — although the decision to stock the cellar with fine wines and feed dozens of house guests, weekend after weekend, was not hers. In 1903, they entertained 68 house guests; in 1906, there were 120. Most of these brought their servants with them– more mouths to feed. The Yorke’s household expenses came to 694 pounds in 1903 (about 40,000 pounds in today’s money;) by 1906 it had risen to the equivalent of 88,500 pounds. When it turned out that some tradesmen’s bills had not been paid, Ellen was arrested for theft. This is a more complex story than can lend itself to television drama — but it is engrossing reading! Was Ellen ruined? Vindicated? Was Louisa Yorke forced to testify in court? Did Justice triumph? In great houses, the housekeeper had to keep the Railway Guide, Crockford’s Clerical Directory, and Burke’s Peerage in her office. In addition to all the other stress of constant inventories, hiring and firing, and making or ordering supplies, she was responsible for seating and housing the visiting servants according to the rank of their employers, and errors in precedence could cause endless turmoil and ill-feeling. Not all the housekeepers Boase studied suffered disaster; the formidable Hannah Mackenzie helped to convert Wrest Park in Bedfordshire into a military hospital during World War I, then moved to the United States and became Housekeeper for the Vanderbilts at a time when great houses were struggling for survival in England. She lived long enough to enjoy a cigarette and a glass of whisky on her 100th birthday. There are two photos of Hannah Mackenzie on the cover of The Housekeeper’s Tale. Housekeeper Hannah MacKenzie, in the 1920s, and in the kitchen when she was still a cook. She eventually worked for the Vanderbilts. Book cover, The Housekeeper’s Tale. The story of Grace Higgens, who served a complicated family of Bloomsbury artists and writers at Charleston Farm from 1920 to 1971, and was sometimes painted by them, shows both the unconventional 1920’s and the hardships of World War II. Her 41 diaries are now a resource for biographers of Vanessa Bell and her sister, Virginia Woolf, of Duncan Grant, and costume historian Quentin Bell, among others. 1858: Can opener invented. Preserving jar with screw lid patented. 1901: Life expectancy for men is 45; for women, 49. First vacuum cleaner patented. 1909: Persil washing powder arrives in British shops. 1911: 1.4 million indoor servants working in Britain. 1931: [Only] Five percent of England and Wales employs a resident domestic servant. You can read the text of the original 1861 Mrs Beeton’s Book of Household Management complete: click here. Recipes, servants’ duties, laundry, budgets, etiquette…. If you need to know how much to pay a butler, or the correct way to pay a call, the duties of a scullery maid, or what tools a Victorian kitchen would have, this is the resource that Victorian households relied on. Unfortunately it is not searchable, but it’s easy to skim chapter by chapter. About My Buttonbox — Frau Buttonbox recreates superb 1920s clothing. Inspirational! My Year in 1918: What would it be like to read only newspapers and other writing from 1918? LACMA (Los Angeles County Museum of Art) Costume and Textiles Dept.